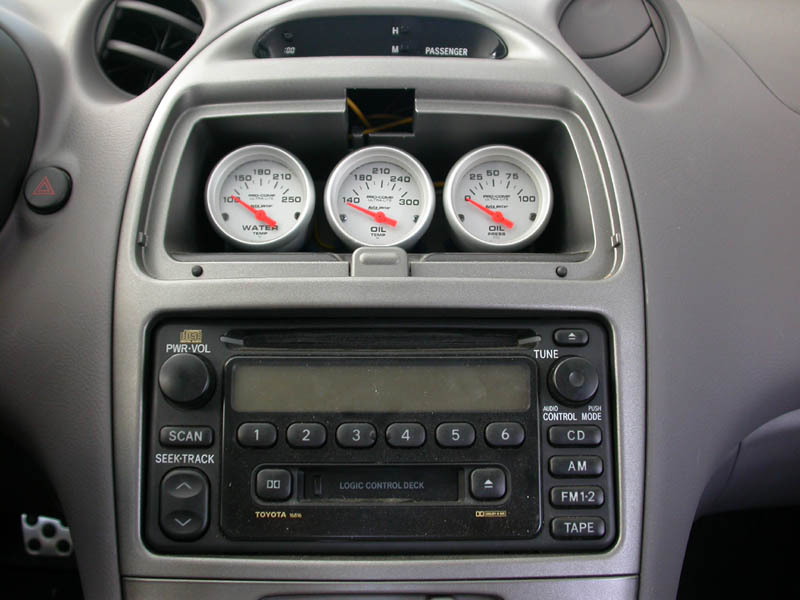 Note: These gauges are made by Autometer and deals specifically with instalation of that particular brand. Gauges of other brand might require different methods to instal properly. However, this guide should still come as a handy reference guide. Electrical vs Mechanical, what’s the difference? It’s simple, really. A mechanical type uses a direct acting mechanism to send data to the gauge. In theory, this should provide 100% accuracy. An electrical type transforms the mechanical data to electrical data before sending to the gauge. Improperly calibrated readings of electrical signals increases the chance of false readings. This variable is not present in a mechanical guage. But, assuming the settings on an electrical gauge is spot on, it should have the accuracy of a mechanical gauge. I wouldn’t worry about deciding which is best as they are both proven to be dependable. The tach/speed meter and new drive-by-wire throtle bodies on the Celica are all electrical. If made correctly, it can be very accurate. This is the perfect place to tap in for pressure readings. Even Toyota thinks so. There’s another location on the head for the 2ZZ-GE but I personally think this is the best location. 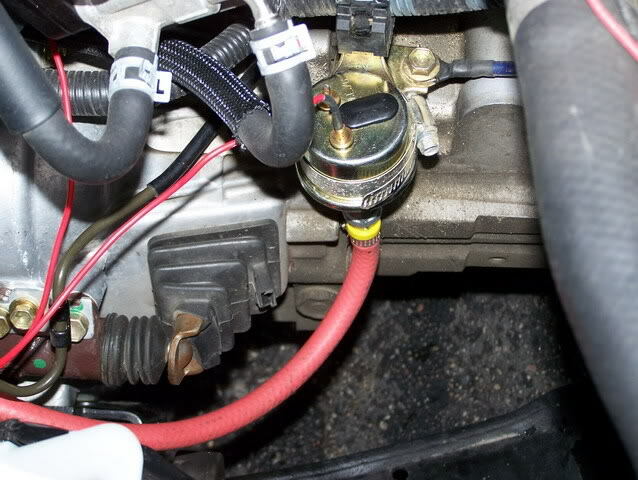 Disconnect the wiring and unscrew the oil pressure switch. Remove any remaining Locktite residue on the thread and block. Screw the 1/8″ NPT T-fitting to the 1/8″ NPT-1/8-29 BSPT adapter before bolting it on the block. Bolt the adapter to the block. Screw in the stock pressure switch and the oil pressure sender on the T-fitting. Coat all threads with teflon tape. Note: Be very carefull not to apply excessive weight to the T-fitting when screwing on the oil sender and switch. 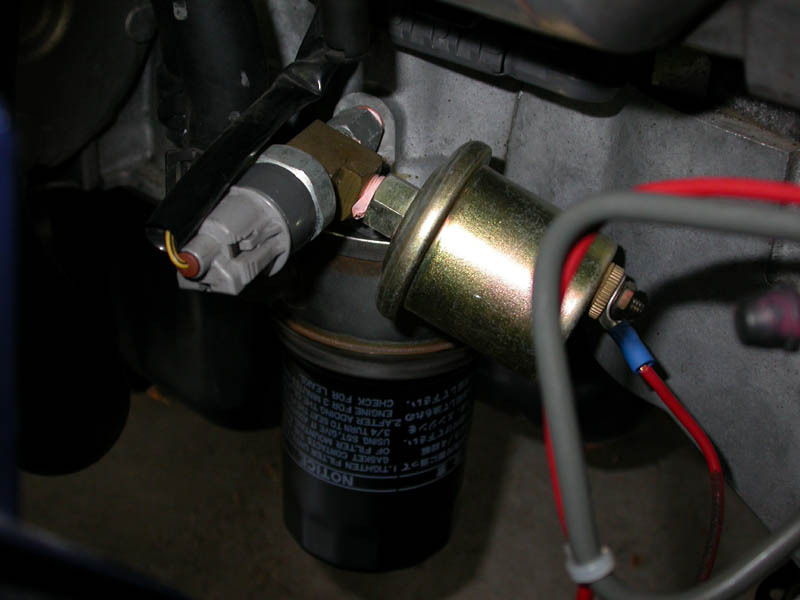 Note: It would be wise to isolate the oil pressure sender from the block to avoid possible wear and failure. 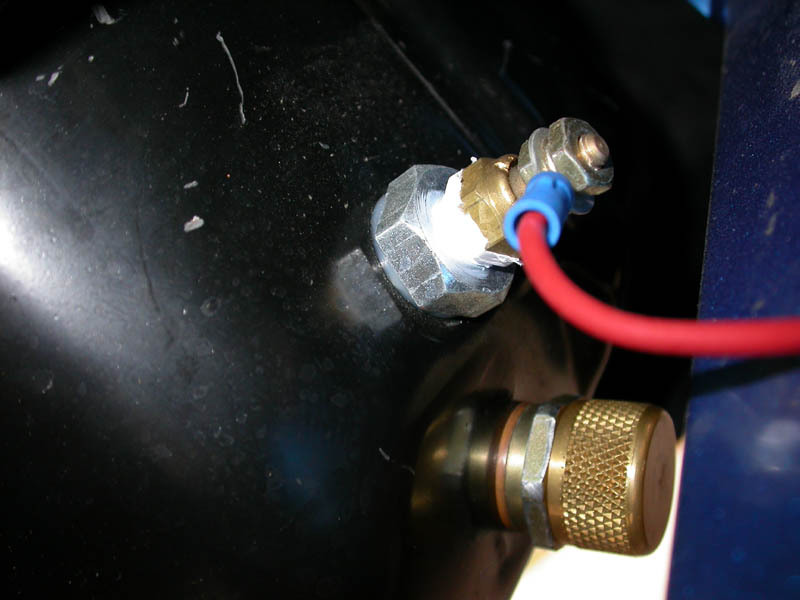 A high pressure hose and additional fittings are needed. The oil pan seems like the most popular place to source temp readings. It’s probably a good idea to instal the sender here. You can also tap in through the factory oil drain plug. However, since the plug is awefully small in diameter, it would be nearly imposible to drill a hole in the bolt big enough to fit the 1/8″ NPT sender. Not to mention the mess removing the sender every oil change. You need to remove the oil pan and drill a hole to instal a port to which you can screw in the sender. Drain the motor oil. Remove the oil pan. Drill a hole approx. 2″ above the oil drain plug. Sandwich the hole with drain plug (#PAB-80250). This will allow you to screw in the 1/8″ sending unit. Make sure you coat the sending unit thread with teflon before instaling. There is no need to use any teflon tape on the drain plug. Just be sure to use the nylon washer. Tapping the sender on the block drain-plug hole requires very little work and will yeild a fairly accurate temp reading. The electric fan turns on at 199F as specified by the factory manual. The Autometer gauge should be a hair above 195F at this point. 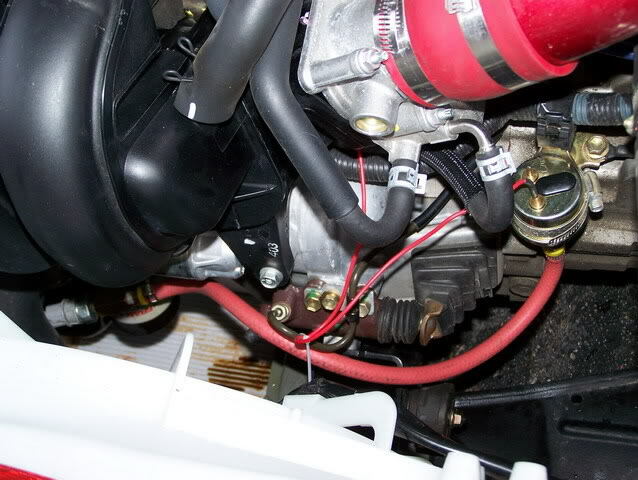 The ‘block drain plug’ is located under the exhaust manifold. You can see a portion of the manifold heatshield from the picture above. Use jackstands or a lift to access the bolt from underneath the car. Remove the drain plug with a 14mm. Let the coolant drain out the hole. Be carefull not to get any coolant in your eyes. 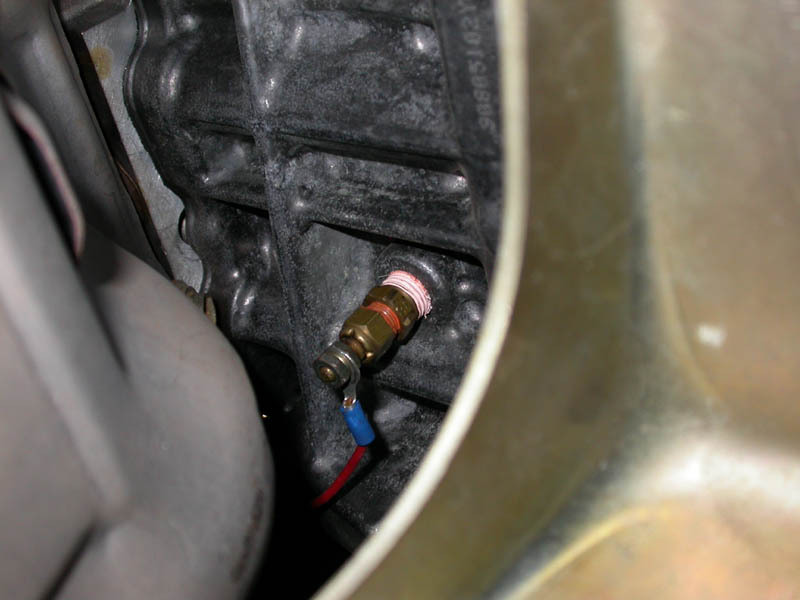 The 1/8″-3/8″ brass adapter is included with the Autometer gauge. top right corner. 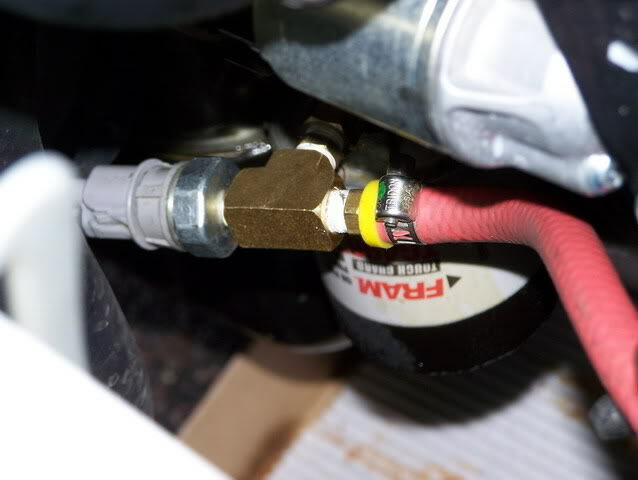 Coat the adapter thread with teflon tape before screwing it in the drain hole. Next, coat with teflon tape and screw the sending unit to the adapter with a 12mm. Make sure the fitting is tight and snug. Remember, the threads are tapered. It will wedge itself tight. Refill the engine with coolant. Start the engine and check for leaks. Well as I found out if you T the oil pressure sender to where it shows in pics you will be asking for trouble. Mine was like that and the fittings broke dumping oil all over the driveway. At least it wasn’t while I was driving. Here is my solution to that. If you run it like this there is less chance of the weight from the sender breaking the fittings.